31st March 2011. In this edition we launch the new HN5i ready to order from ExplorOz, plus our NEW ExplorOz Spare Wheel Bin Bag and loads of other great news including the names of the latest winners in our Redarc competition. There's plenty of good reasons to read this latest e-Newsletter from ExplorOz.com - we announce the launch the NEW ExplorOz Bin Bag, the new Hema Navigator HN5i, confirm the resolution of the site performance saga, plus we feature a new edition of one of the most popular books we've ever sold to travellers and loads more! If your name is listed here, please contact our office on (08) 9403 3737, or email info@exploroz.com before Friday 8th April to claim your Redarc prize. Our next Redarc promotion runs across the next two months. 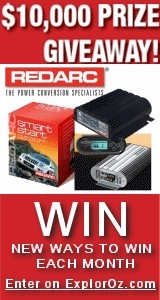 To win a Redarc Battery Charger worth $495, simply buy a Display Listing in the ExplorOz Trader anytime during the months of April - May 2011 to go in the draw. We have 4 to giveaway! Competition Details, Terms & Conditions, are available online. Get ready for your next outback trip by carrying a bin bag on the back of your spare wheel. We think these are the perfect solution for ensuring your litter is responsibly dealt with during your travels, so thanks to everyone who contributed to our recent Forum post. Brand New Edition Over 200 More Sites, Updated Info, New Maps, and Even More Photos. Hema Maps have just announced they are releasing a new version of the Hema Navigator, the HN5i, which will be launched at the National 4x4 & Outdoors Show in Brisbane on April 9th 2011 (if you’re planning a visit to their booth, tell them ExplorOz sent you!). The new HN5i uses the same hardware as the HN5”, however it features a brand new street navigation software: iGo Primo. Street Navigation will also be pre-loaded with the locations all of the 3700 campsites found in Camps Australia Wide 6. 4WD Navigation has been upgraded to EZI OZI, a very user friendly, icon based version of the OziExplorer Software. Plus the unit now comes with an 8GB (upgraded from 4GB) SD Card PLUS a Hema Explorer and Memory Map Trip Planning Application on CD (for trip planning on your PC). And it’s still only $899! To Pre-Order this item from ExplorOz for delivery to you mid-April, just click Here. Regular site users will be aware of various ongoing issues experienced in recent weeks due to the migration to the new server. The good news is that we have ironed out all this now and current users are reporting great satisfaction with the new speed and new search methods in Forum, Blogs and Site Search. Please feel welcome to share any feedback using our site Feedback Form. Enjoy! Our newsletter is distributed to 41,312 subscribers on a fortnightly basis.